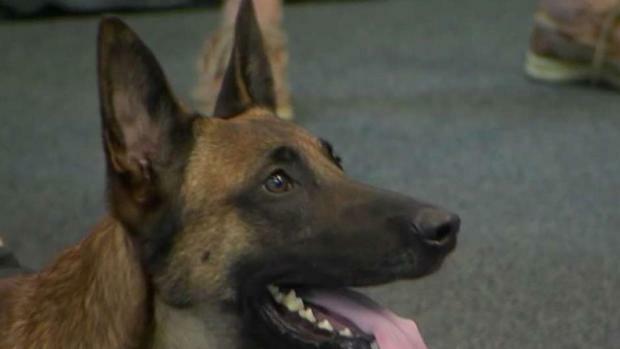 Nero, the K-9 partner of the late Sgt. Sean Gannon of the Yarmouth Police Department, has been cleared to to run, swim and play ball. Nero, the beloved K-9 dog of late Yarmouth police Sgt. Sean Gannon, received some good news this week. According to the Cape Cod Times, Nero has been cleared to resume normal activity by Dr. Edward Kochin of Cape Cod Veterinary Specialists in Bourne. That means Nero can now run, swim and play ball. "K9 Nero continues to heal and get stronger as hre recovers from his partner being tragically murdered and him being shot in the line of duty," Yarmouth police said in a statement Thursday. Retired Yarmouth K-9 officer Peter McClelland broke the news in a post on Facebook. The K-9 dog of Sgt. Sean Gannon continues to recover after being shot less than a month ago. "Today was both a happy and sad day for me," McClelland wrote. "It has been eight weeks since Nero was shot while on duty with Sgt. Gannon. CCVS was instrumental in saving his life...CCVS will forever be a part of the YPD especially the K-9 unit." Nero is still not fully recovered, and will continue to live with McClelland for at least the next 30 to 60 days as he recuperates. Gannon, 32, was shot and killed while he and other officers were serving an arrest warrant on career criminal Thomas Latanowich at a home in Barnstable on April 12. Nero was also shot in the face and neck. Latanowich, who is being held without bail on murder charges, allegedly sent text messages to his ex-girlfriend stating "I killed a cop" and "I shot a k-9" during the incident.